Please see the attached for October’s invoice. Thanks! Whoops, sorry. Forgot to attach. Here you go! I’m guessing something like this has happened to you at some point over the years, right? We use email for everything and we are accustomed to clicking “send” after jotting down a message. It is so easy to forget to attach that attachment. A forgiving design prevents mistakes before they happen and if they do occur, helps the user to minimize damage. It’s up to us as business leaders, designers, engineers, and researchers to minimize risk for users. Curious users can explore the program when they aren’t afraid to press that “mystery button” (Lidwell, 2003). William Lidwell’s Universal Principles of Design (2003) is a widely respected collection of helpful strategies to create a more user-friendly product. For aspiring UX professionals and veterans alike, we highly recommend you check this book out. In one chapter, Lidwell outlines six tools for incorporating forgiveness into your designs. The following sections describe each of these six tools in further detail. Ex. 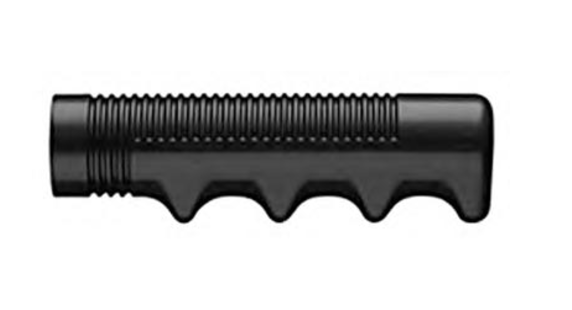 A uniquely shaped grip that encourages the user to hold a tool in the correct way. 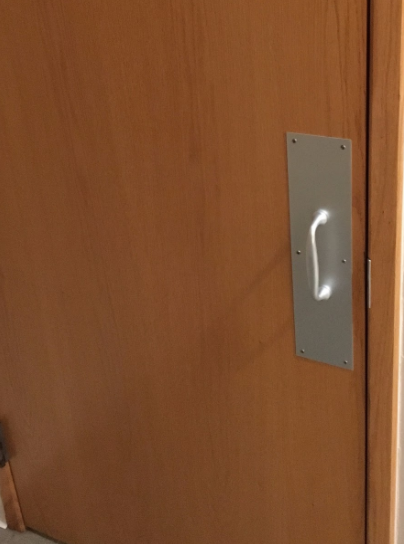 Another great example of a good affordance are door handles (see below). How many times have you tried to push open a door that was meant to be pulled? Or vice versa? 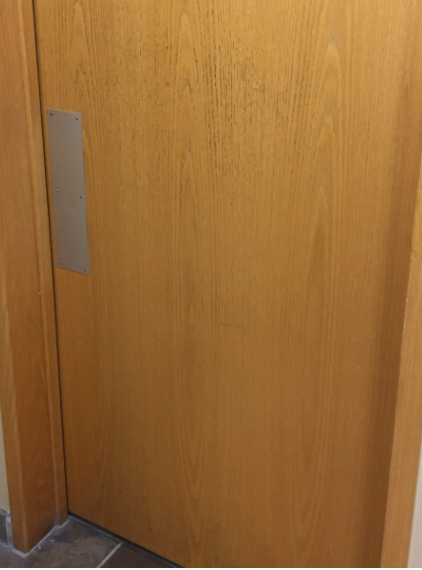 The door shown below has physical characteristics that facilitate its proper use: a handle designates that you grab and pull toward you; no handle implies that you place your hand against the plate and push away from you. Don’t be afraid to take advantage of physical characteristics to make the user’s experience more obvious to them. If the user needs the ability to hit an emergency stop button, making that button large, raised, and highly visible will help enable accurate execution of that action. Good affordances are the first step in avoiding headaches for your users, as they help prevent errors in the first place. “The “undo” button in a computer program such as Microsoft Word. Lidwell cites the “Undo” button, which is an obvious (and great) example. Having the ability to take back the action just made is powerful. It not only saves time but also takes the pressure off of any given task, allowing the user to be more comfortable, exploratory, and creative in his/her work. Ex. A runaway truck ramp. As a somewhat more recent addition to the world of writing, Google Docs incorporates an auto-save feature in any document you create – and it updates about every 5 seconds. Perhaps more valuable than this feature is the fact that the user can go back through the history of that document and start working again from any point they choose. This is extremely helpful in the rare cases where you inadvertently delete a paragraph, but don’t realize it until several minutes (or hours) later. This feature allows you to essentially press the “undo” button a million times – but, have the option to stitch together the missing parts from your document with the more recent changes you’ve been working on lately. Include safety nets in your designs, whenever possible. They are the last line of defense. Kind of like sandbags in the event of a flood, or underwear in the event of everyday life. You can have the most user-friendly, forgiving system in the world, but someone, somewhere is going to manage to commit a catastrophic error. It’s up to us as UX researchers and designers to save their work and progress when that happens. Ex. The ‘safety’ mechanism on a firearm. The above example in Google’s Mail service is an example of confirmation, but there are confirmation windows all over computers these days. Confirmation is important when critical actions can be executed by mistake – especially when critical actions are proximate to other commonly used functions (i.e. “Minimize” is very close to “Exit”). Be sure to implement the principle of confirmation whenever big events can occur at the click of a button. Another good example of the confirmation is present on devices such as the Roku device and the Amazon Fire. For those of you that have small children, you know that they like to chew on remote controls. Roku’s remote provides “quick selection” buttons for common apps like Netflix and Amazon. Sure enough, however, your baby will chew on one of those buttons and you think, “Oh, no! Now I’ll need to re-find this episode of The Office (that I’ve already watched 8 times).” Lo and behold: a pop-up message comes up on the TV, “Do you want to exit Netflix and continue to Amazon?”. Pry the remote from gooey baby fingers. Select “no”. Way to go, Roku, you saved the day. These are quite similar to confirmation. However, warnings inform you of the risk involved in performing an action or that something bad is about to happen unless you intervene. That is, they don’t necessarily require an action on our part for the event to take place. As we grow increasingly reliant on our mobile devices and laptops, the low battery warning in our electronics is particularly anxiety-inducing. The rush to the power source may be stressful, but the warning to plug back in is usually quite effective. An unexpected shutdown can cause lost progress, so warnings need to be blatant and obvious in their meaning. Inform the user of not only what is at stake, but also precisely what they need to do in order to right the situation. It is already common, but no less crucial, to provide a way for users to get help and ask questions about the product they are using. Lidwell cites help lines, another effective tool frequently used is the presence of online community help boards. Often coupled with online chat services, online help boards allow users to post questions about their own struggles, find answers to previously asked questions, and connect with other users of the system or product. If you’re interested in learning more about design principles, check out Lidwell’s book: Universal Principles of Design. As a final note, always remember that even very small changes, like confirming that you want to send an unattached email, can make the biggest differences. Source: Lidwell, W. (2003). Universal Principles of Design. New York City, NY: Hachette Book Group.